A rainy morning gave way to a sunny and warm afternoon where the Eleven took the field looking good and ready to continue the positive start to the 2012 Season. Gunners came out with some possession and pushing the ball out wide, but BCS used some midfield pressure to reverse momentum. After a few chances at either end Fran Taylor took one for the team by challenging a 50/50 ball and getting crushed; the ensuing bounce led to Brian Doucette breaking into the box, rounding the out-coming keeper and putting the ball away with a deft touch. After the first goal the XI were consistently pushing through the outside against some of the weaker defenders on the Gunners back line. Adam Palencia got a good through ball out wide, took a touch toward goal and blasted a shot from the corner of the 18 over the keeper into the roof of the net. A goal worthy of his Man of the Match honors. Just after the 2nd goal the home side was brimming with confidence and displaying some beautiful one touch passing cutting through the Gunners midfield and defense a marvelous looking play ends with the ball in the back of the net again, though called back for a narrow off-side call. The half ended 2-0 to the dominant home team. Knowing the history and strength of the Gunners squad it looked like the BCS XI would be in for a real fight in the 2nd half. However, the XI came out strong. OHPG did work their way back into the game toward the middle of the second half with some sustained pressure; though, unlike in years past the Eleven hold fast with defenders Brad Rawson and Peter DeGregorio marshaling the back line. BCS XI continues their strong play in the middle of the field with Dave Kodack, Mike Howard and Josh Gagnon all having solid games. There could have been a few more goals with the chances being created. Paul Fomenky consistently pushed the attack and felt the brunt of some rough play from the Gunners' defense which easily could have earned the visitors more yellow cards, though the referee remained quiet. The most obvious of these instances was when Paul latched onto another through ball into the box, the keeper came out and tried to claim the ball but Paul touched it past the keeper who could only reach for the attacker's legs as he jumped to avoid impact. Despite being taken down there was no card and no foul called. Late on in the second half Gagnon got the ball wide right, headed toward the endline then sent the ball across on the ground just outside the 6 yard box, it came through to Paul who didn't realize how much space he had and tried to flick the ball out to an on-rushing Marco Moreira but the ball was behind the wide-open man and eventually cleared. Josh got an almost identical ball out wide where he took it more toward goal for a short range blast that the keeper fails to clear. 3-0 to the Eleven. The goal, and afternoon were marred by an incident that could have been avoided had the referee taken more control of the match and calmed some of the opposition protests throughout the match. The only ones controlling the match were the XI who showed skill on the ball and intelligent movement through the full 90 minutes. 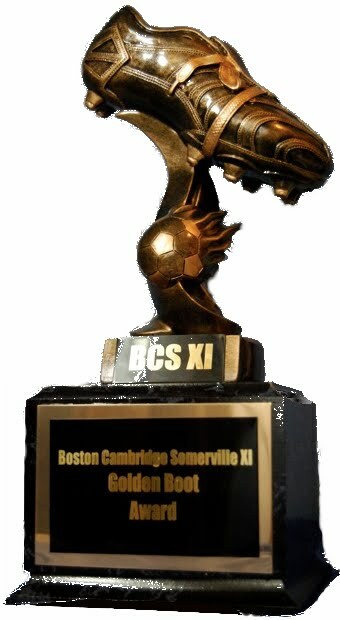 Next week will see BCS XI face off against Kendall Wanderers C team in a re-match of last year's McKenzie Cup 1st Round. Don't miss the exicting game kicking off at 4pm in South Boston's Moakley Field. BCS are hoping to match their strong start to the season with a deep run in the cup.